Mission: The Missouri Conservation Commission protects and manages the fish, forest, and wildlife resources of the state; serves the public and facilitates their participation in resource management activities; and provides opportunities for all citizens to use, enjoy, and learn about fish, forest, and wildlife resources. 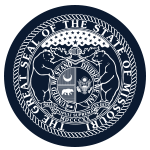 Function: The Missouri Conservation Commission controls, manages, restores, conserves and regulates the bird, fish, game, forestry and all wildlife resources of the state, including hatcheries, sanctuaries, refuges, reservations and all other property owned, acquired or used for such purposes and the acquisition and establishment therof, and the administration of all laws pertaining thereto. Member Requirements: Members must have knowledge and interest in wildlife conservation.